How to acquire the DVD? The Feature disc has the release version of the film, with subtitles in six languages: French, Finnish, Dutch, Spanish, English, and Russian. The "Extras" disc includes an introduction to the project, as well as a "making of" featurette. Also, there is a conversation between Marja (Sissi) and Marjo (Sissi's analyst) about Sissi's case. This is paired by an enlightening dialogue between Françoise and Thomas (Artaud, Antonin, Herlat...) about acting in multiple roles, as well as a piece that develops the analogy between music and psychoanalysis, and two more reflections on madness. The disc also includes several short scenes that didn't make it into the final film. 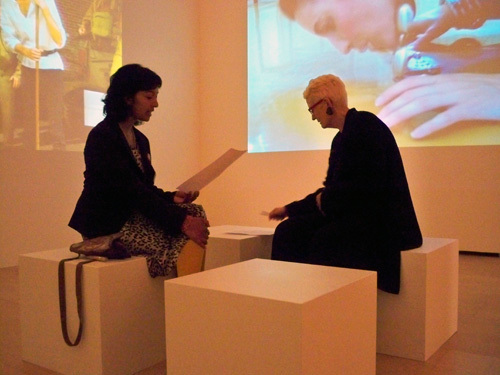 For detailed information about installations and their exhibitions, see http://www.miekebal.org/artworks/exhibitions. The project constitutes an attempt to offer museum and gallery visitors experiences they don't ordinarily have. In a combination of shock, pleasure, strangeness and beauty, they will make a journey through 'madness', rather than sitting in front of the screen, as in the cinema. It is aimed at people interested in video art, unusual narratives, and uncommon audio-visual sensations ' and mental illness. This is a project of multiple video installations through which the idea of 'madness' is given a variety of interpretations. It is an experiment in audio-visual story-telling. 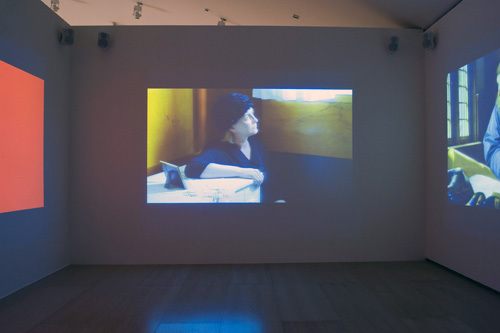 Distinct from cinema, in the installation the 'second-person', the visitor, is in charge of making the stories through their own itinerary and combination of stories, portraits, and scenes on view. The visitors will wander through the spaces and keep encountering new forms of madness, some tragic, some humorous; some play-acting and some 'really mad'. 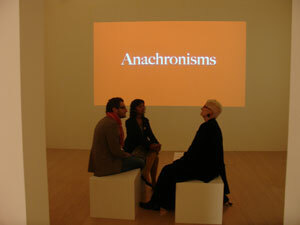 Meanwhile, visitors are implicitly requested to ponder the question: are they mad, do they play the fool, or am I too rigid to allow them to be sane' The temporal narrative of film is spatialised; the visitor, ordinarily seated and still, composes his or her own narrative by choosing itineraries and pace. This last aspect constitutes a challenge to the usual format of exhibition, and the exhibition of the moving image in particular. The patients in the exhibition unravel their life stories, to keep visitors fascinated enough to spend the time necessary to really experience the encounter. Hence, it is no longer the time of the videos that determines the experience but the pace, choices, coordination and combination, the spatial behaviour and the degree of interest that sets the clock. Our artistic concept includes turning a medium that is naturally a temporal one into a sculptural work. It is also premised on the importance of something uneasily called 'beauty' in the encounter with madness that is the thematic heart of the entire Mère Folle project. Various artistic means have been deployed to increase audience engagement. The overall goal of our installations is to make it attractive to visitors to overcome what we have come to call 'the last frontier': the difficulty in social relations to deal with people we consider mad. Madness traverses all social, ethnic, age and gender groups. The artistic experience of the encounters we stage is offered as a contribution to overcome this last remaining boundary in the social domain. For now we have two installations already on view. 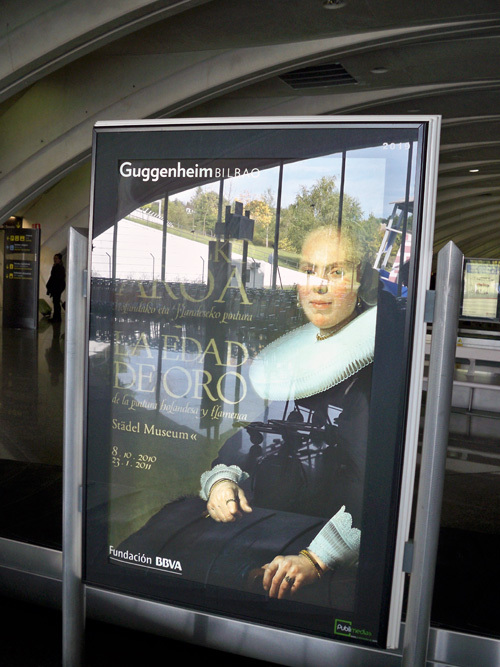 In Bilbao, the 3-screen installation Anachronisms/Anacronismos is on display at the Guggenheim in connection to the exhibition Edad de Oro 17th Centurry Dutch and Flemish paintings from the Städel in Frankfurt, Germany. The Space In-Between was shown in Pécs, Hungary to illuminate the idea of intermediality. 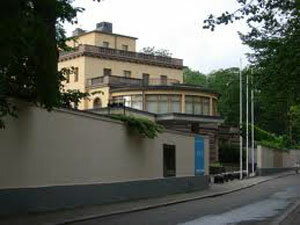 In October 2011, we will have a large exhibition of several installations in the Museum Ars Nova, Turku, Finland. 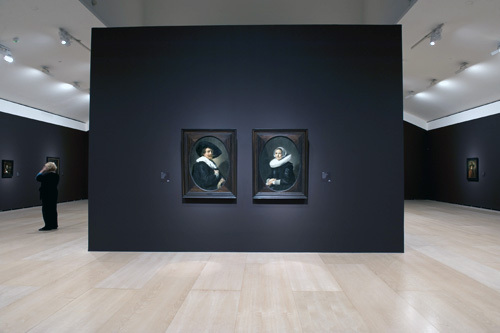 This three-screen installation combines images from the project with details from paintings of the seventeenth-century Dutch and Flemish collection of the Frankfurt museum. 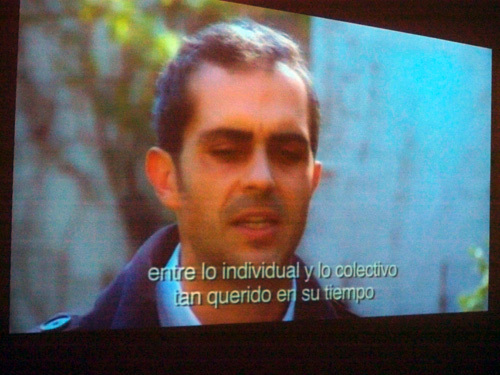 It is on a ten-minute loop, alternating between English and Spanish subtitles. It is an obvious, ostentatious anachronism: an exhibition of seventeenth-century paintings from the Städel collection, in Gehry's huge and spectacularly contemporary building of the Guggenheim Bilbao, from October 7th 2010 to the 23d of January 2011. The anachronistic nature of the show is foregrounded, if only by the discrepancy between the scale of the paintings and that of the building. For us this clash between paintings and the building that housed them triggered our installation concept. Anachronism is an historical error; it means going against chronology. Hence, anachronism is heresy. For chronology is sacred in the study of art. This study is based on the assumption of evolution, of an ongoing improvement of technical and representational skills, and of concepts such as influence ' in the period in question, painters studied and emulated older masters, and masters taught students in their studios. Indeed, historians tend to think of anachronism as the worst mistake, and they are not wrong. It implies projecting a contemporary vision on a past for which that vision could not yet exist, and hence, cannot be relevant. Thus, it is historically naïve and it hampers insight into that past one seeks to understand. Anachronism, one might think, flattens time, makes everything resemble the present, and thus clouds the paintings with irrelevant considerations. Often, such criticisms are justified. When it is deployed with an awareness of what one is doing, however, anachronism renews, refreshes, and innovates the historical object; it makes that object relevant for today again. The fresh feeling the exhibition gave the paintings, as if they had all just been cleaned and re-varnished, came from the new, contemporary environment in which they had been hung and the rigorously modern way this hanging had been designed by Städel curator Jochen Sander. From the simple combination of the historical paintings and the contemporary building and setting, we conclude that anachronisms are a vital figure in visual culture. In our installation, we foreground anachronism rather than, for example, continuity, in visual culture. For, assuming continuity would be another way of making the paintings seem contemporary, but it would also risk erasing historical difference. In our video installation we have tried to explore how a strengthening of anachronism brings us closer to these paintings, not as a heritage from the past but as partners in a discussion of what matters in contemporary culture. But this approximation does not come at the cost of historical difference; on the contrary, it enhances it, deploys it as a tool to sharpen how and what we can see. This is not to say that all anachronisms have the same effect, on the contrary. Anachronisms invigorate our interactions with historical objects. They can achieve this revitalizing by means of at least four different responses to the past in relation to the present. In our installation we have tried to demonstrate this through an exploration of four different relations between images (of which only one enhances a certain linearity): clash, continuity, projection, or reversal. We demonstrated that it is the plurality of relations and the possibility to hop from one to another that makes anachronism a useful, creative, and liberating approach to history. The Mère Folle project lends itself particularly well to demonstrate this, as it is entirely based on the anachronistic encounters between the Fools and the Mad, as well as different times from the twentieth century. This installation shows the way in which space can be considered a medium. ' Space is taken to be performative in the sense of speech act theory ' meaning that the sign, here, the space itself, has an effect on its recipient. The performative power of space between analyst and patient lies at the heart of Françoise Davoine's social approach to psychoanalysis; her attempt to make the theory and practice less individualistic and do justice of psychoanalysis as a profoundly social science. The practice of this conception is what makes the psychoanalytic space itself a medium, as we attempt to show with the installation. Françoise has a capability to practice immersion into the deliria of her patients, in order to become a fraternal equal to them. We call it 'extreme identification'. 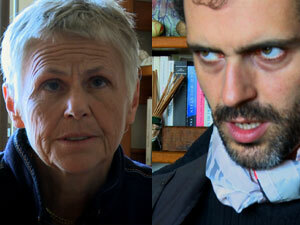 Through her intensely compassionate look we see her impact on Herlat's angry, desperate, bewildered or anxious face. Something of the order of relationship traverses the space. This is how the patient can heal. We made a simple installation of two facing screens. On one we see Françoise, on the other Herlat. Between the screens is a carpet, connoting the domestic interior of the consultation room of a private practice. On each side there is an armchair at the 'entrance' of this sparsely indicated enclosure. These stand at the edge, not quite inside the space. Visitors choose a 'side' to take, with the analyst or with the patient, but they can change or move the chairs. The space is somewhat narrow. Added to this is an effect of the footage. Some of the close-ups are 'dirty', which means you see the back of the other person vaguely in the frame of the face of the other. This expresses a two-dimensionality, or a spatial closeness, in accordance with the sense of intrusion we would feel when attending the psychoanalysis of another. This is an exhibition of multiple video installations through which the idea of “madness” is given a variety of interpretations. It is an experiment in audio-visual story-telling. The time-based medium of film has been spatialised. Distinct from cinema, in the exhibition, you the visitor (the “second-person”) are free to make the stories through your own itinerary and pace, engaging the stories, portraits, and scenes on view. As a combination of exhibition and installation, Landscapes of Madness attempts to alter predominant categories within the art world. Meaning is not offered simply to be consumed, but is created by and within each of you. Landscapes of madness constitute a voyage of discovery that can take any length of time, from several minutes up to several hours depending on your interest. But we hope all visits will be immersive experiences, leading up to engaged and engaging encounters. The exhibition offers experiences both familiar and unfamiliar. In a combination of shock, pleasure, strangeness and beauty, you make a journey through what is usually called “madness”. Our staged “madness” comes in various forms, which are deeply affecting, hilariously funny, and unexpected sources of wisdom. They have in common the social nature of madness. Both violence and its perverse assaults on individuals and societies generate madness as a defence mechanism. Also, the equally violent refusal of the general public to engage with mad people on an equal footing, contributes to the continuation of madness as social isolation. Sensitive to the complexity of this known but ultimately unknowable state of being, our madness shows several faces: theatrical folly, the resurfacing of trauma inflicted by war and the deep wounds of abuse. Like madness, landscapes are also social constructs. They have a history. It is in landscapes that wars have been fought, people have been hungry, and destruction has been wrought. We not only present landscapes in the videos; we also create landscapes in the galleries. Far from being compulsory, the loose itinerary is open to returns, circular movements, and individualised pace. You will wander through the spaces and keep encountering new forms of madness—some tragic, some humorous; some play-acted and some “really mad”. This raises the question that you are implicitly requested to ponder: are these people, and the people I encounter mad, do they play the fool, or am I too rigid to allow them to be sane; and what does the answer to that question say about me? From the entrance, the first thing the visitor sees on a large floating screen is images of the dead patient, Ariste. His head is projected large on the central screen. Different contexts succeed one another: he appears in the mind of the analyst; he hovers over a toy army of soldiers; he gossips about the analyst inside a tank: just images where his face looms over the (smaller) others. On a monitor we see fragments where the deceased Ariste is the object of talk by others. In the second gallery, two ambivalent forms of cheer from the history of subversive moments in otherwise regulated societies will be shown on a large screen and monitor. Both moments are looped so that they alternate within the same video and between them two. They alternate in a kind of anachronistic rivalry where chronology and anti-chronology alternate: the late-medieval charivari and contemporary carnival. On a monitor across from the other monitor, a former patient recites a poem to two children. Beginning with 'Madness comes in three halves' the tone is set for another subversive moment, now without noise in a regular, domestic situation. In the narrow corridor between galleries 1 and 2 we display a range of portraits of a mix of 'mad', 'fool' and 'sane figures. The visitors will make up their minds about what's what in this portrait gallery, which references obliquely the selectiveness of official portrait galleries. In a horizontal row, portraits of fools, mad people and their doctors are on two opposite walls in the narrow corridor that leads from the museum shop to the exhibition space. This next room visualises the way war, and other forms of violence, cause madness and remain active in doing so, even after the official war is over. Two screens show war in two different forms: the one first seen upon entering the gallery projects visual images of different war-generated situations: a red room where fools stomp around against a backdrop of sand bags protecting against bombs; two fools, resembling Don Quixote and Sancho Pança enact a foolish sibling rivalry, a pointless struggle, on top of a tank; a man explains to children what the function was of a bunker half buried in a forest landscape. On the other screen, at a 90° angle, a schoolmistress explains the war to uninformed pupils, alternating with conversations among survivors of the Spanish Civil war. The sound alternates between the two screens. On two monitors at the other side of the gallery, also at a 90° angle, fragments of the madness of patients touched by war can be seen, and heard through headphones. 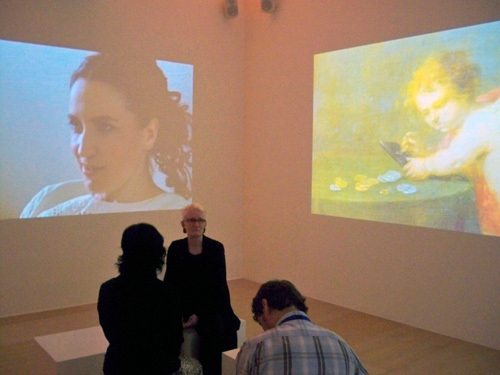 Two opposing screens show projections of the two sides of a psychoanalytic situation. On the one side the patient, on the other side the analyst. The images can be watched alternately in any rhythm. 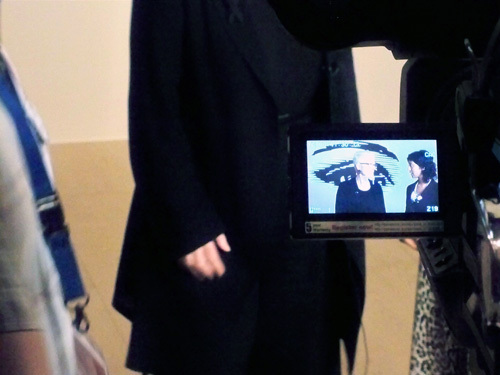 The sound renders the alternate voices of both participants. A monitor, with sound on headphones, displays the analogy between analysis and music in the workshop of a restorer of ancient instruments. In the two corners of the gallery floating screens display the two sides of the debate: the medieval fools and early 20th century mad geniuses who form the court, and the psychoanalyst on trial, with behind her a motley crowd of fools who are the cheering public. The pillar in the centre of the gallery symbolises the persistent difficulty of understanding between the two parties, eras, and groups. In the narrow transitional space to the next gallery two monitors display odd moments where madness and sanity nearly touch each other. On the left in a small space of gallery 6 a mini museum of photographs is arranged. The photos are from the island of Seili, where a gorgeous landscape rivals with people inhabiting the asylum, and those destined to cure them. The remainder of this gallery displays the extensive treatment of one patient, whose abusive childhood has condemned her to decennia of hospitalisation. Her determination to retain dignity leads her to dreams of grandeur. These make her change dress, makeup and hairstyle for every session. The relationship between her and the analyst is both tense and warm, her madness leaves glimpses of wisdom, and her suffering makes everyone relate to her. The treatment is projected on a large screen. On a somewhat smaller screen images on Seili Island relate to the photographs, also taken on the island. 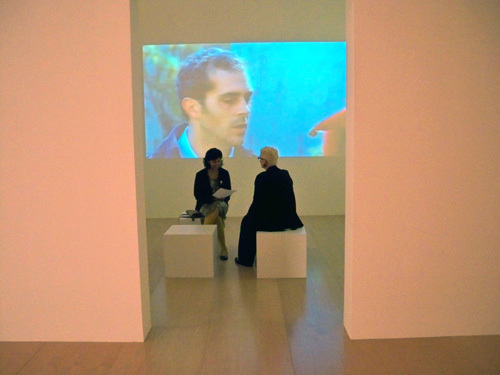 On a third wall projection we see conversations between the analyst and Sissi's mother. The last gallery ' or the second, if one chooses the opposite itinerary through the installation ' is a kind of sculpture garden. Four blocks, cubes or rectangular masses on the floor have back-projected, 'talking heads' of people who waver between madness and sanity. Sound comes from 'shower' speakers so that each cube can be heard as well as seen, while the others remain in the background as long as one is concentrated on a single one. It is also possible to see all four from a distance.